Highly decorated Girl Scout and Patrol Leader, cheerleader, student council officer, honor roll, dean’s list and aerobics champion Ronda Beaman has kept up her badge habits! The first recipient of the NEA’s Art of Teaching award, Dr. Ronda is the mother of USA Today’s Most Creative Family, highest rated speaker at the Young President’s Organization, author of the award winning book, “You’re Only Young Twice,” director of Leadership Studies at California Polytechnic University, and a highly sought after speaker, life coach and fitness trainer. She is Chief Creative Officer for the research and consulting firm PEAK Learning, Inc. and a national thought leader for The American Health Network. She has been featured on major media including USA Today, CBS, NBC and Fox and was anchor for the television magazine Seattle Today. Dr. Ronda earned her doctorate in leadership, paying her way by singing telegrams dressed in a gorilla suit. She has been Professor of the Year at three universities and named one of the Top Ten Outstanding Women in America. Contact her at littlemissmeritbadge@gmail.com and earn badges of your own on her Facebook app The Merit Badge Project. Beaman’s book proves you can have the best of everything, even in the worst of circumstances, if you are willing to work at it. 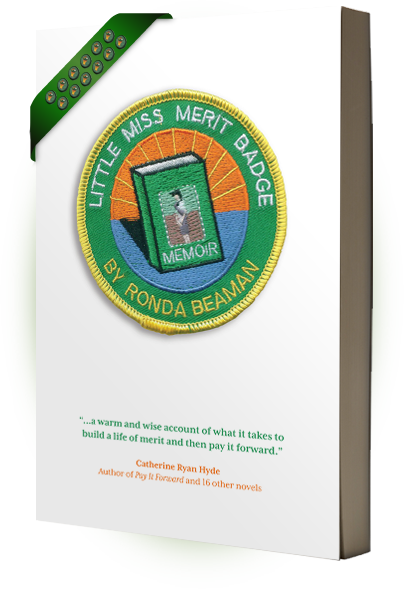 “Little Miss Merit Badge” is a warm and wise account of what it takes to build a life of merit and then pay it forward. This book beckons you to look at life and learning in a whole new way and by the end makes you better at both. Ronda Beaman can sew the Laughter Badge onto her double sash of accomplishments. 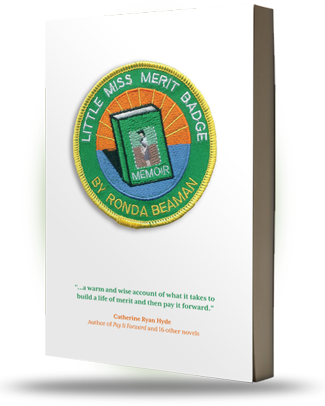 "Little Miss Merit Badge" is funny, poignant and meaningful. "Little Miss Merit Badge" shows there is a climber in all of us and Dr. Beaman makes us laugh and cry over her heartwarming ascent through adversity. Blind Adventurer, Motivational Speaker, Author of "Touch the Top of the World"
She was hooked by the age of six. The on-going, outrageous dys- function and denial in her life was enough to turn anyone into an addict. Nationally recognized university professor and internationally renowned speaker Ronda Beaman confesses her drug of choice was earning Girl Scout badges. Lots of them. And she never quite kicked the habit. A humorous, yet harrowing memoir that explores the nature of resilience and the accomplishment addiction many young girls develop to compensate for growing up in a challenging environment. Here are the goods! All the essentials for you bloggers, tweeters, and writers. Ronda Beaman has had a lifetime worth of entertaining experiences to share. Her press kit comes equipped with imagery to compliment her intriguing story. All images are free to use for news and press coverage. For inquires, questions, interviews and everything else please feel free to use the form below to get in contact with Ronda.